The Tricorythodes hatch is remarkable in duration on the best streams; its species are multibrooded (Multibrooded: Producing more than one generation in a single year. Baetis mayflies are a classic example. Insects which produce a single generation with two distinct peaks (like the June and September hatches of Isonychia bicolor mayflies) are not multibrooded, because the fall insects are offspring from the previous fall instead of the current year's spring.) and may provide consistent morning fishing from July through October, rather than emerging for a few weeks and moving on to different waters. The literature about the distribution of Tricorythodes species is a bit confusing, but the general impression is that Tricorythodes stygiatus is the most important in the East, followed by Tricorythodes allectus and then Tricorythodes minutus. The latter species is the most important in the West, where it can grow up to hook size 18. Because of the difficulty of identification and wide variation within species, there is no need to learn to identify them. Instead, check with local fly shops for the preferred hook size on your rivers. Trico action tends to be more intense during the heat of summer, when the flies must finish their business early before the hot sun dries them out. Later in the season their deadline is less strict and they become sporadically active through most of the morning. Male Tricos emerge throughout the night and are not known to be important as duns. They molt into spinners and await the hatching of their mates. The little olive females emerge in the morning. In the summer this happens at first light, but it occurs later in the day as the weather cools down. Female duns can be important to trout, as can the nymphs as they rise to emerge. The female emergence can be fun to fish, but its action rarely compares to the spinner fall. Swisher and Richards claim in Selective Trout that the duns are more important in the West than in the East. "From far away they resemble a slow-moving white cloud of dust." After mating, the males fall spent (Spent: The wing position of many aquatic insects when they fall on the water after mating. The wings of both sides lay flat on the water. The word may be used to describe insects with their wings in that position, as well as the position itself.) and the females fly to shore to rest while squeezing little green balls of eggs from their abdomens. They return in about half an hour and fall on the water to drop the eggs. They can fall spent (Spent: The wing position of many aquatic insects when they fall on the water after mating. The wings of both sides lay flat on the water. The word may be used to describe insects with their wings in that position, as well as the position itself.) or take off again for another round. Shuck: The shed exoskeleton left over when an insect molts into its next stage or instar. Most often it describes the last nymphal or pupal skin exited during emergence into a winged adult.) has completely detached from their tails. This give the impression of a mid-air molt; it is the same illusion created by Ephoron mayflies in the evenings. 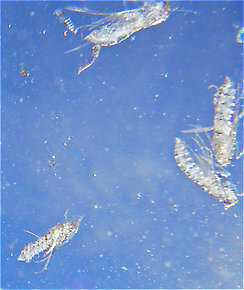 The nymphs are terrible swimmers, and trout eat them in good numbers as they struggle toward the surface to emerge. Opinions of Trico nymph fishing vary between authors, with some stressing its importance and others saying to favor the adult stages. I lean toward the latter group. 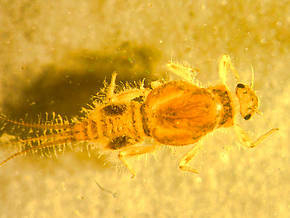 Operculate: Lidlike; usually used to describe the pair of enlarged elytroid gills (called the operculum) which some silt-dwelling mayfly nymphs like Caenis and Eurylophella have developed to shield their other gills from debris.) gills which protect their other gills in these silty environments, but they may be found in other habitats, too. 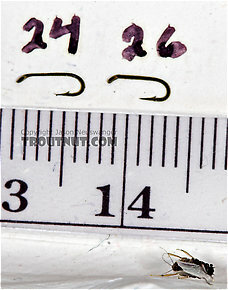 When imitating such small insects, it is extremely important to get the hook size right. The trouts' impressions are governed not by millimeters but by relative percentages. They don't see a 4mm imitation as "just a millimeter" different from a 3mm insect; they see it as 30% larger, a freak, a giant compared to the flies they're eating by the hundreds. One hook size makes all the difference in the world. 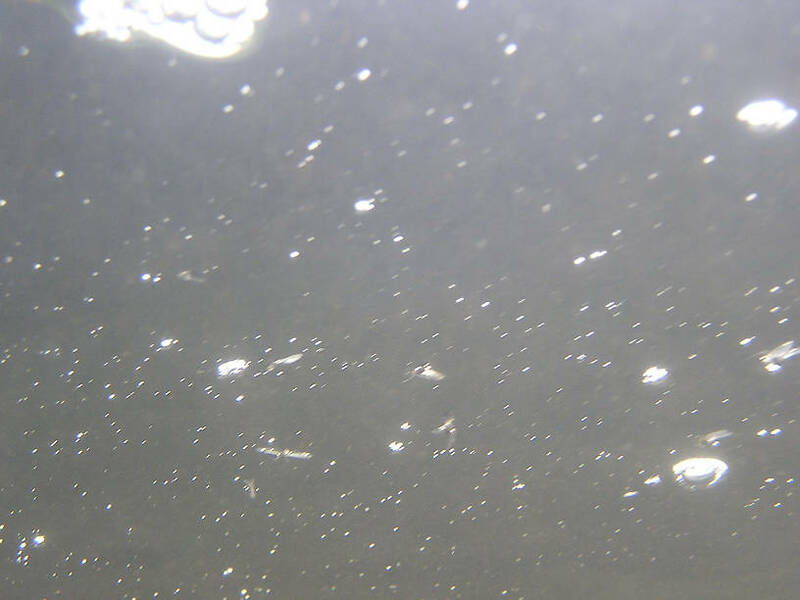 Such small flies are especially susceptible to microdrag (Microdrag: The imperceptibly small unnatural motions of an artificial fly on the water, caused by its connection to the line. A trout's whole life is spent watching things drift naturally, and unnatural movement too subtle for us to detect is obvious to their specialized senses. ), and Caucci and Nastasi propose making short casts and using full-hackled patterns to mitigate this problem. Their rationale is well-explained and demonstrated with simple calculations in Hatches II. They also recommend using hooks with up-turned eyes, which have a larger gap in the tiny sizes, although some anglers complain of low hooking success with these hooks. Trico spinner falls can be so thick that it's necessary to track a rising trout's feeding rhythm and deliver the fly at just the right moment so it has some hope of being picked from among the thousands of naturals. Sometimes trout eat more than one Trico with a single gulp, and inventive anglers tie imitations of two spinners on one hook. Such flies offer the trout a better mouthful and are less susceptible to drag. Another Trico innovation is presented in Kelly Galloup's excellent book, Cripples & Spinners. It is the "Ellis Triple Wing," a spent (Spent: The wing position of many aquatic insects when they fall on the water after mating. The wings of both sides lay flat on the water. The word may be used to describe insects with their wings in that position, as well as the position itself.) spinner pattern based on the observation that the Trico's wing is about 3/4 as wide as the body is long. Such a profile is poorly imitated by the hourglass shape of traditional spinner wings, and the new pattern is an easy-to-tie correction. I have applied the same principle with good success to many other mayfly spinners. Galloup, Kelly. 2001. Cripples & Spinners. Dean Publishing.